Teetering on that edge between winter and spring, I dressed the table with elements that reflect this “seasonally challenged” time of year. Looking in the yard, we have both bare trees and the heads of early spring flowers emerging. We’re starting to hear the birds chirping at daybreak, too. We have all seen these versatile ivory plates from TJ Maxx. I use them frequently because they can so easily switch from one mood to another…kind of like the weather in the Kansas City area! 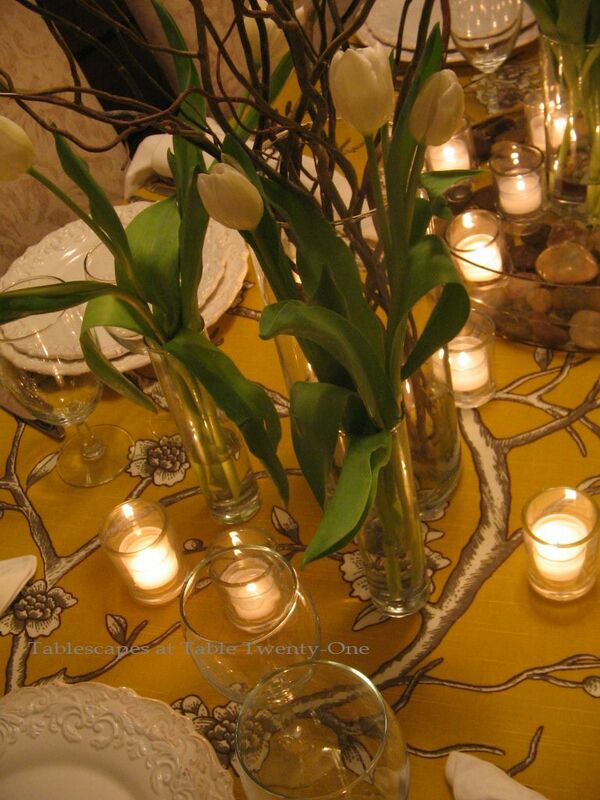 The design also seemed to complement the flowers in linen’s the tree branches. I bought these oil rubbed bronze napkin rings at Pier One a couple of years ago. I’ve never had a chance to use them until now. I didn’t want to go all Hitchcock and overdo the bird theme with this table, so it is the only other aviary reference besides the table linen. 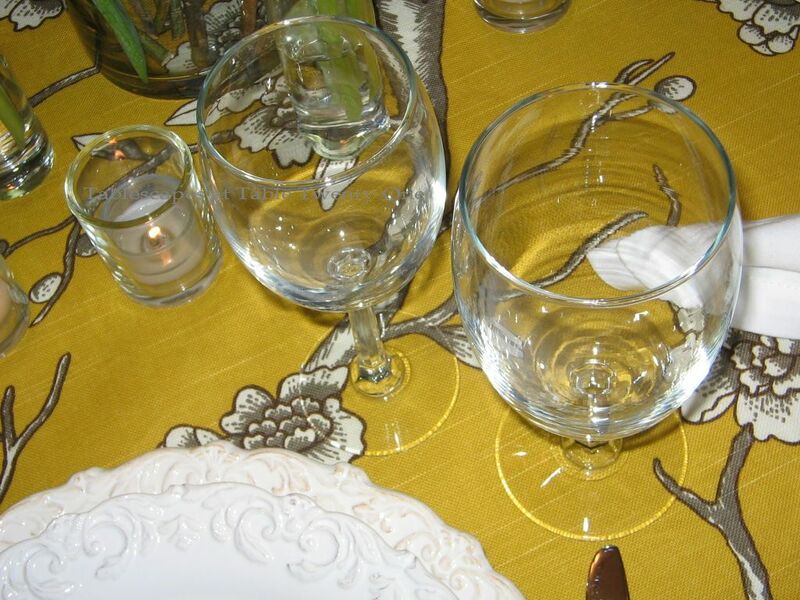 To keep the look of the table’s center consistent, I used plain clear glass stemware. 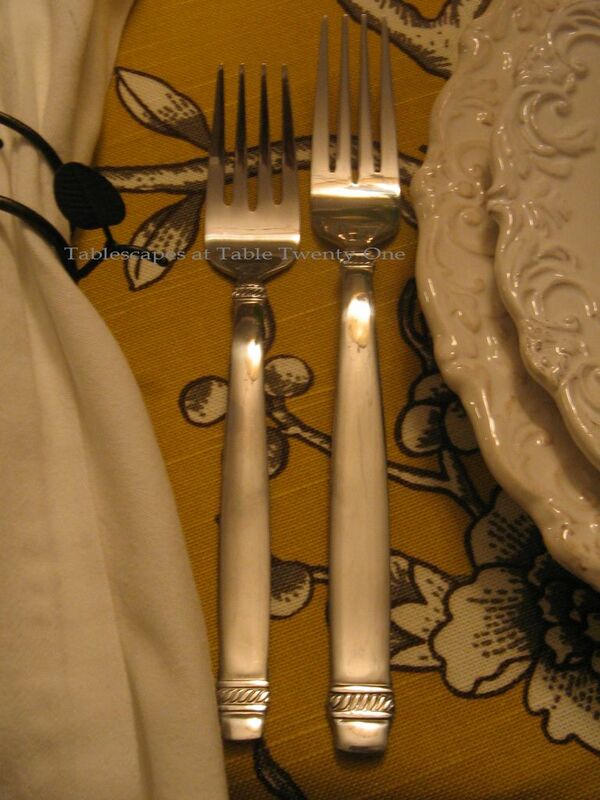 Simple banded edge stainless flatware is used so as not to conflict with the busy pattern of the linen. This is another table linen that I made!!! When I saw the fabric, I just had to have it! I found the deep mustard color very attractive, and the birds in the nearly naked branches reminded me of the fickle change of seasons. This 15.5″ low glass container was used to offset the dead center of the tablescape. Smooth river rock in the water reminded me of a brook. Votive candles nicely reflected off the water, reminding me of how the stars shine on the nearby lake. A simple arrangement of tulips – a sure sign of spring – in the center added height, color, and visual depth. Keeping with the clear glass used in the center, I filled these narrow cylinders with tulips. Placing two small vases on each end rather than one seemed more interesting than a single larger vase. To mimic the linen pattern and to add lots of height to the center arrangement, I used curly willow branches in tall glass cylinders. This added to the natural, outdoorsy feel. The simple addition of 15 clear glass cylindrical votives subtly lights the buffet adjacent to the dining table. I hope it’s much closer to spring where you are today! Thanks for stopping by, and don’t forget to check out the work of all the other incredibly talented tablescapers at Susan’s Tablescape Thursday! 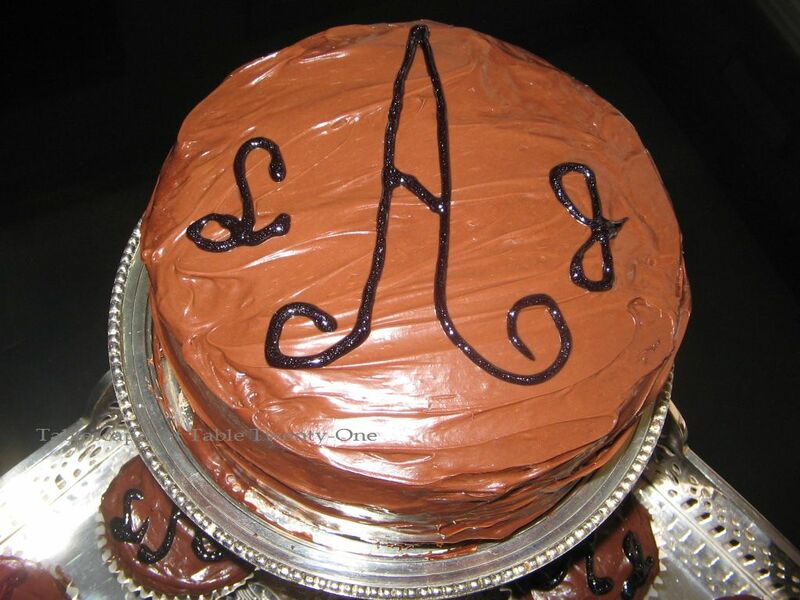 Alycia, your table is perfect. I love the fabric you choose for the topper. It’s perfectly perfect for this time of year. It looks like it’s a heavier weight? Love the willow branches and the tulips. What an effective use of the votives.. They are wonderful in this setting. 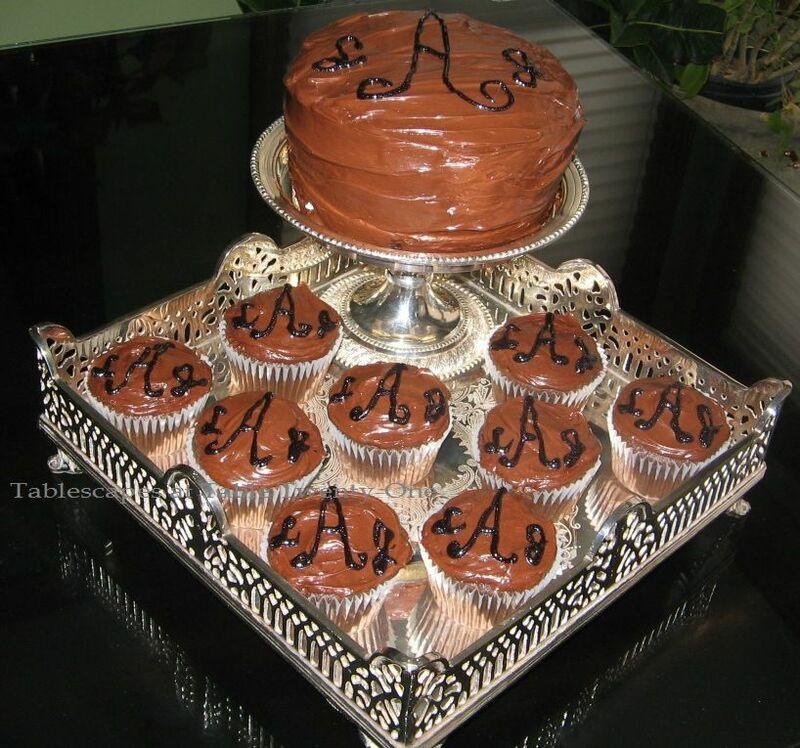 Love the cake and cupcakes. That was a lot of work. Great table and and it looks like a great crowd. This is getting scary! Guess who just bought decorating fabric to make a tablecloth with BIRDS on it!!!! I’ll be working on it, but check in a few weeks for the Toile Tale version of your post:-) Love your cloth and the white dishes are purr-fect with it. Hope you had a wonderful reunion. What should we do next? OK…yup…it IS getting kinda weird!!! I tell you, either we were separated at birth or the universe has lined up just right! I can’t wait to see your edition! Hurry up and sew faster!!! 🙂 As for what we should do next….hmmmmmm…how about Mardi Gras? Duh! Too easy, although I have 2 parties on tap next week to celebrate. Maybe I’ll create a tablescape depicting what I’m giving up for Lent. Any guesses? 😉 See ya later! I’m headed over to your place! The highlight of the evening was the tablecloth. I am so proud of you!! It all turned out really nice. Very lovely evening, and very good company. The decorations were nice and warm, and the food was delicioso!!!! Thank you, Robyn, and thank you for your help that evening! We did have fun, didn’t we? I thought I was going to pass out from laughter!!! We will have to do it all again sometime in the spring when we can get outside again. I am SO tired of being cooped up in this house!!!!!!!! Alicia, your table is really stunning! 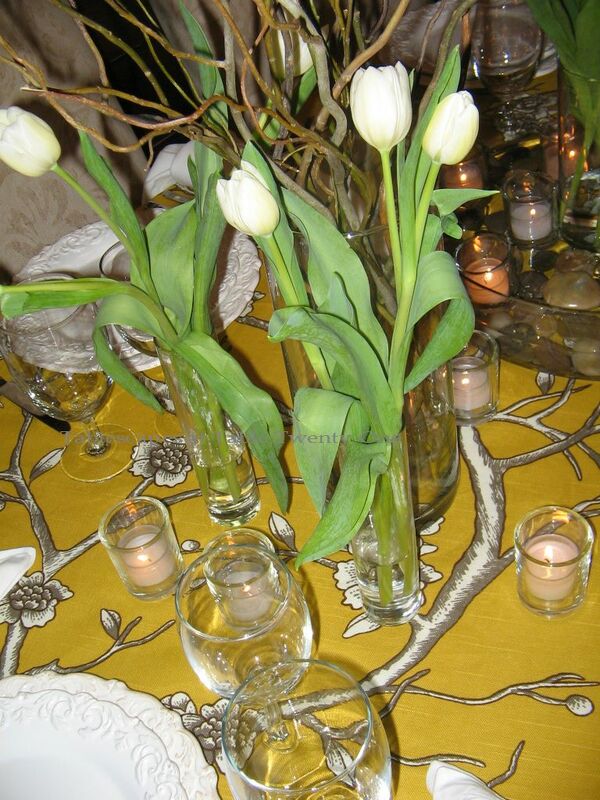 that fabric you found for the tablecloth is fabulous, and I love the combination of the elegant tulips with the bare branches. I had to LOL about your not wanting “to go all Hitchcock” on your table! Love it! 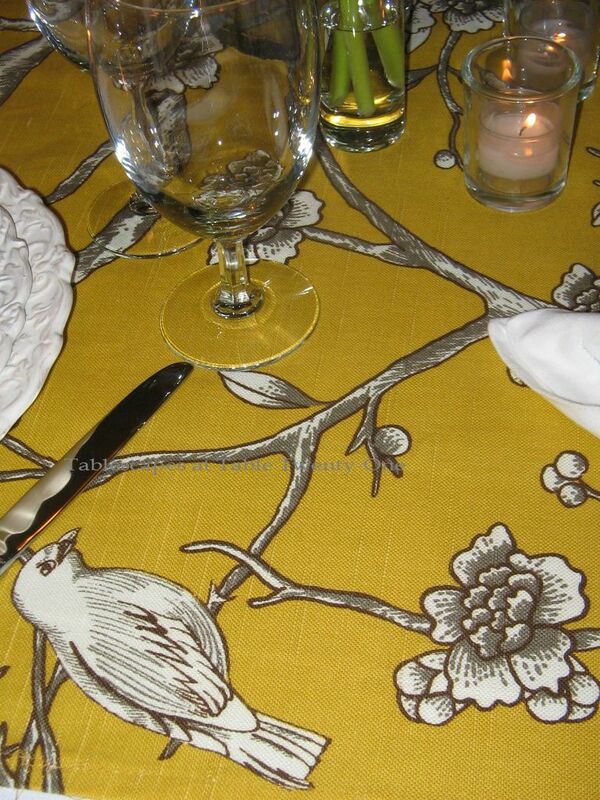 I am crazy about that fabric tablecloth you made with the trees and birds. That’s just so pretty to me. I love the way the napkin rings mimic the twisted limb look. You ALWAYS have the best attention to the fine details like that. That’s my favorite thing about your tables. And the tea lights all over the place created a wonderful atmosphere. Wow. Alycia, I believe you outdo yourself with every endeavor. That is just lovely, and so appropos of the season. I would like to know Loretta’s menu, please. Alycia, sadly I didn’t get your post :-(… I’ve had that happen today too. Maybe when someone is posting at the same? I have no clue and usually I can figure this out.. It’s so discouraging.. But thanks for dropping in! I just found out from some of my FB friends that GMail has been having problems for the last several days. THAT explains why an email I was looking at suddenly disappeared! It’s crazy! I have sent an email to GMail expressing my concern. Meanwhile, I LOVED your table! I was blown away that you made that beautiful burlap tablecloth! I can’t imagine sitting there pulling down all that fringe! You have mammoth patience!!! And VERY clever to use some of that around the candles! The whole table was beautiful, and those dishes…fabulous! The rims of the salad plates were so pretty…I had to go back and look twice more! And that centerpiece covered dish was so fabulous with the little ball feet!!! I encourage anyone who may be reading this on my blog to pop over and check this lady’s tablescape out. The link is http://marlisbennett.blogspot.com/2011/03/table-that-almost-wasnt.html. Ciao, Marlis, and thanks for getting back to me! Ok first off you are SO FAB! No problem spots! We must have been thinking the same thing this week, white and white tulips! I’m lovin’ your take on it!! Those napkin rings just slay me! Is your computer working well now? It’s so great to read your comments. Thank you for stopping by. Wasn’t Sundays weather wacky? What size was your hail? That’s Missouri for ya hunh? Have a wonderful week!!!! Cherry Kay! I just visited your blog awhile ago, and your All White table was stunning! Thanks for stopping by tonight! No, I have never been to Nell Hill’s. Let me clarify that: I have never been to the ORIGINAL Nell Hills in Atchison, KS. I have visited the Parkville location only once about 3 years ago. I actually bought this fabric at…hang on to your hat…Old Time Pottery!!! Yes! They had a table full of designer fabric remnants, and I picked out several patterns. This one is a Raymond Waites. I have one of his books that I just love. I’m glad you like the table. It was a labor of love. Have a wonderful week, my friend! What a wonderful table! I so love your tablecloth, it IS the ideal backdrop for the transistion of the seasons! Your floral medallion on your plate is perfect with the blossom on the trees! I love your addition of the bulbs & branches in your vases! Gorgeous! 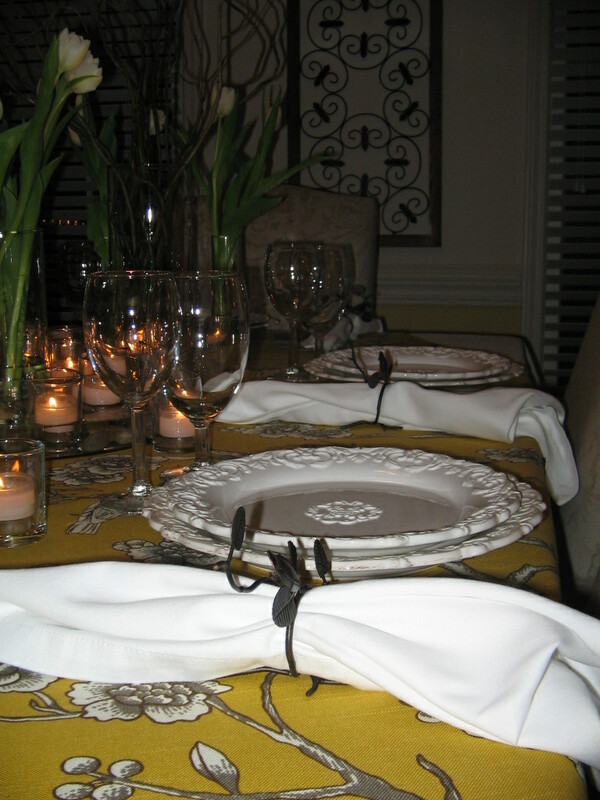 Your newly found hobby of selecting fabric and creating table linens has greatly increased your creativity. That tablecloth is to die for. Thank you, ma’am! I thought you ‘d like that with the birds on it! What an artistic tablescape!! It was very well thought out, and everything blends and compliments so beautifully. 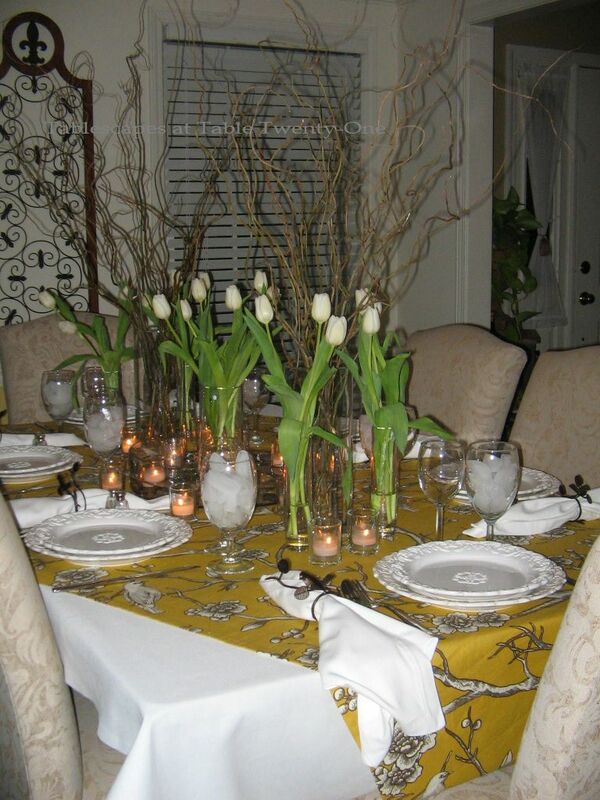 I love the cream color plates from TJ Maxx, and I agree the the flower mimics the ones in your tablecloth. 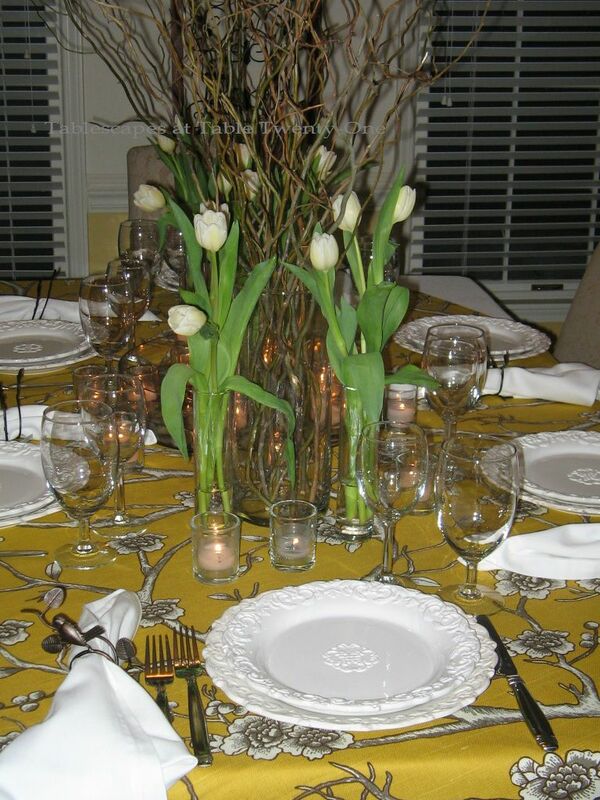 I love that you used tulips (they are one of my favorite flowers) and the curly willow branches were perfect again in mimicking the pattern in your tablecloth. 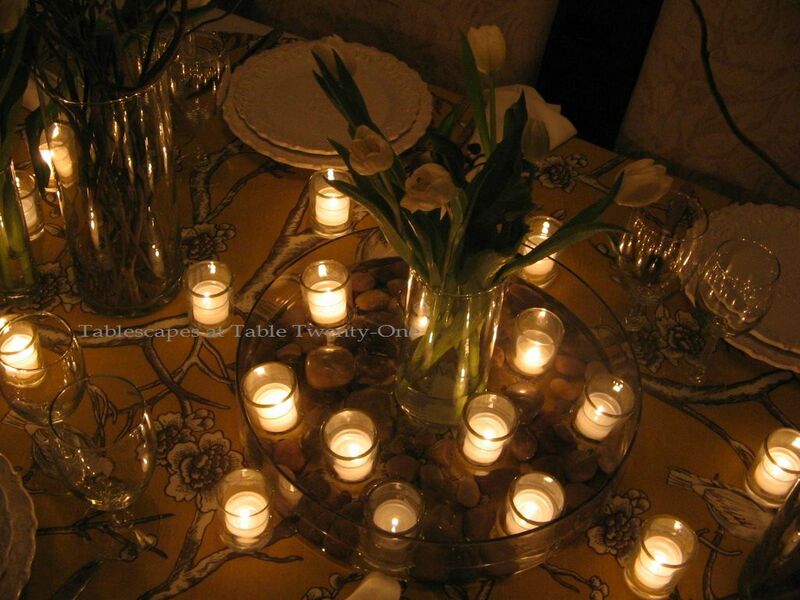 The centerpiece is so restful with the smooth river rocks and the votive candles in water. Your friends and family are fortunate to be able to benefit from your creativity and your willingness to entertain so frequently. I see that as the sign of a generous heart. We also have some bare branches here in our part of N.C., but we do have daffodils blooming, and I have actually seen a few cherry trees blooming! I fear they may get frostbitten, but I hope not. We’ve been hearing the birds chirping at daybreak for a few weeks now — isn’t that a cheerful sound? I had hoped to post a tablescape this week, as I had something else going last week, but unfortunately, I’m under the weather with a cold. Everyone I know has had one, so I guess it’s my turn now. Anyway, barring any unforeseen circumstances, I’ll be linking up at Susan’s next Thursday, so I hope you’ll get to stop by! Denise!!! What are you doing sick??!?!?!! You can’t do that! The weather is trying to take a turn for the better, and you’ve gotta get out there to enjoy it! I will keep my fingers crossed that whatever cold bug has gotten you will die off quickly! You have cherry trees blossoming already?!??!?!!! Wow!!! It still looks like the aftermath of the apocalypse here! 😦 I guess you are in the South, though, so it stands to reason that you’d have earlier blooms. I did see the greenery of what will eventually become daffodils sticking up in the back yard yesterday. It will probably be another 3-4 before they make an appearance. The birds are chirping in the morning, and that is a VERY welcome sound! 🙂 I really do hope you are back in the pink soon. We need to see more of your cool tablescapes! Have a restful weekend, and I hope to see you on here next week! Take good care, and thanks so much for stopping by! 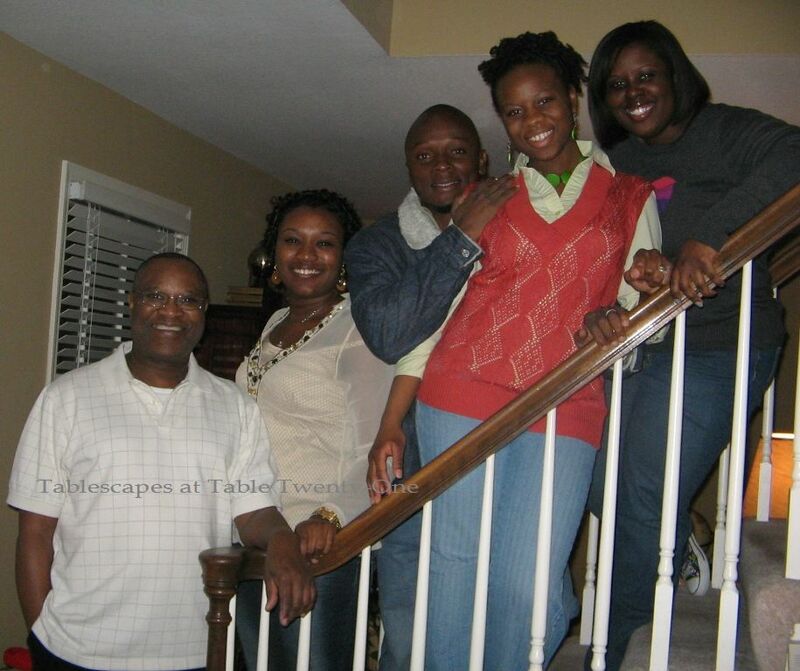 Beautiful table, Alycia…those are some of my favorite plates…I have had them in several colors. Your table linens are lovely. 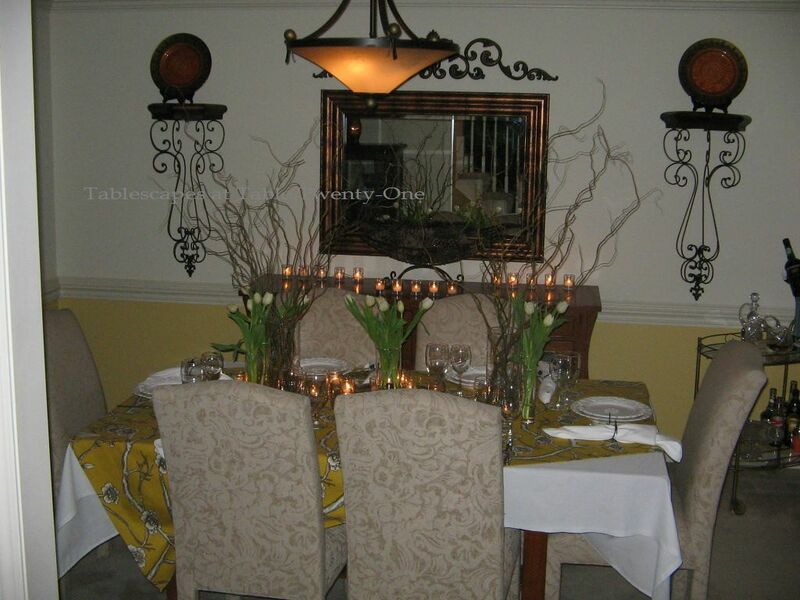 What a wonderful occasion and your table is so festive and inviting for everyone. 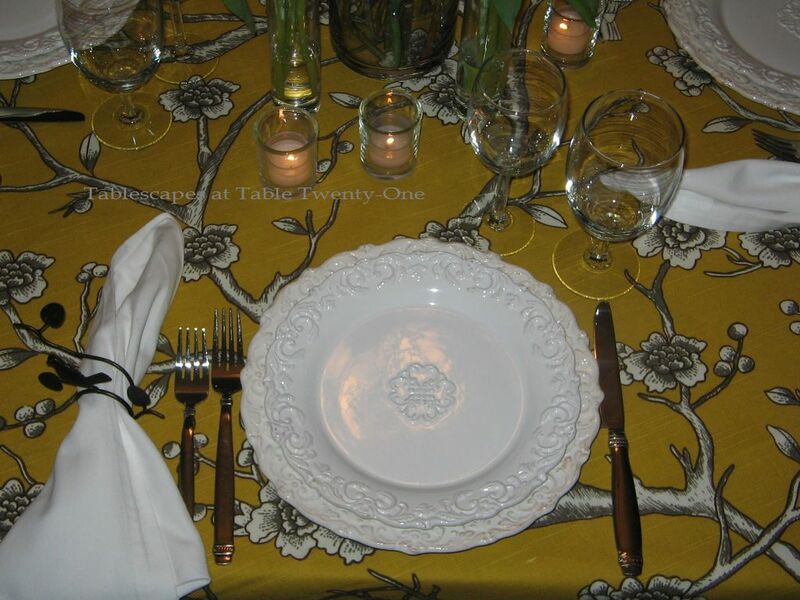 Love your dishes but that tablecloth…GORGEOUS!! I’m sure that you all had a great time (jet lag and all)! Thank you so much! I think the poor dear is STILL in recovery mode! Note to self: NEVER travel anywhere that’s more than an hour away! 🙂 Have a rockin’ weekend! 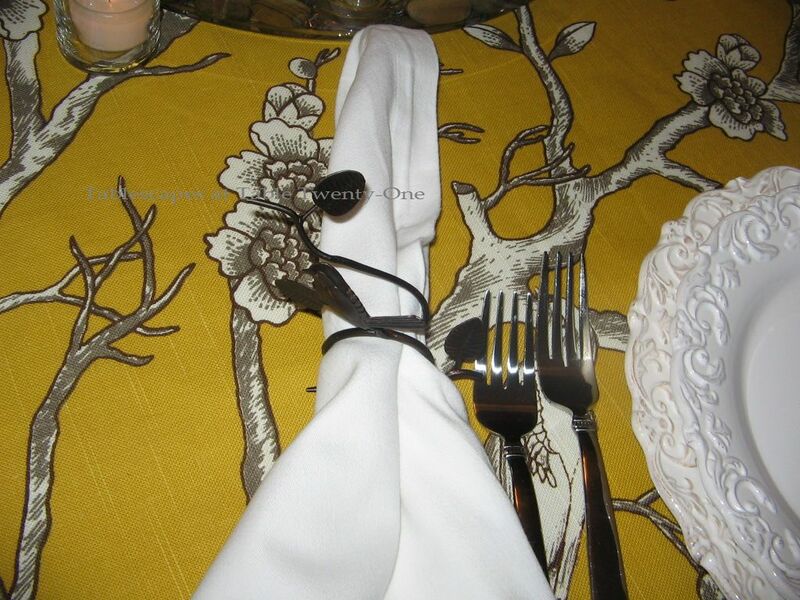 I love the way you pay such thoughtful attention to every single detail of your beautiful, sophisticated table settings. The color combinations, textures, unity & variety, sense of drama — all the perfect blending of logic and intuition! Most of all, I admire your joie de vivre. 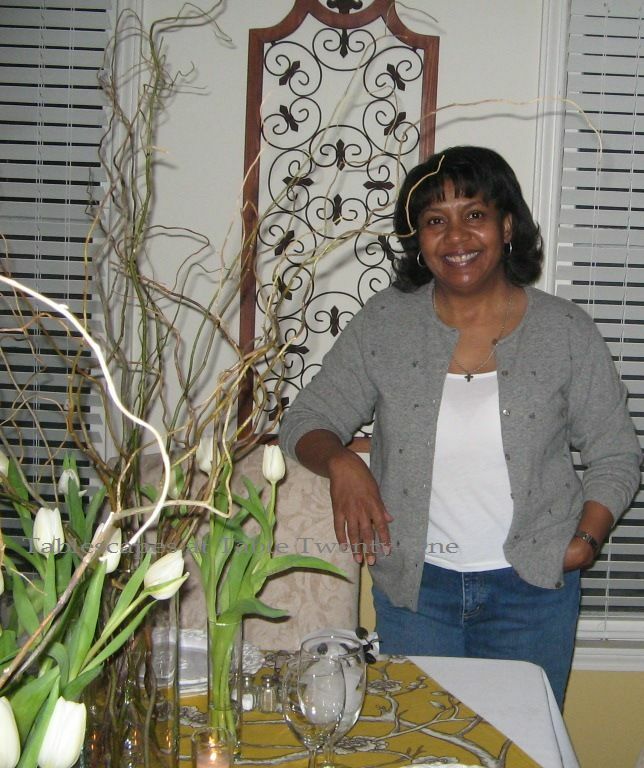 It comes through in your tables, your breezy writing style, your delightful humor, and your beautiful smile! Thank you for your visits and for the day-making comments you leave for me. I always love visiting your blog — just finished reading your reviews of your favorite books on entertaining. You made me want to read all of them … I think I’ll start my letter to Santa early this year! Bill, you are a Southern gentleman by every definition of the term! Thank you so much! I’m honored. Enjoy your weekend, and have a blowout Mardi Gras!!! What a good idea to overlay the white cloth with the printed pattern which then really shows off the white dinnerware and ties it back to the bottom cloth. My what a long sentence to say well done. Gorgeous! The tablecloth you made! WOW! I love the dishes too…you all had a great time. I love the overlay with the tbcloths, it gives me an idea when I don’t have a perfect fit. 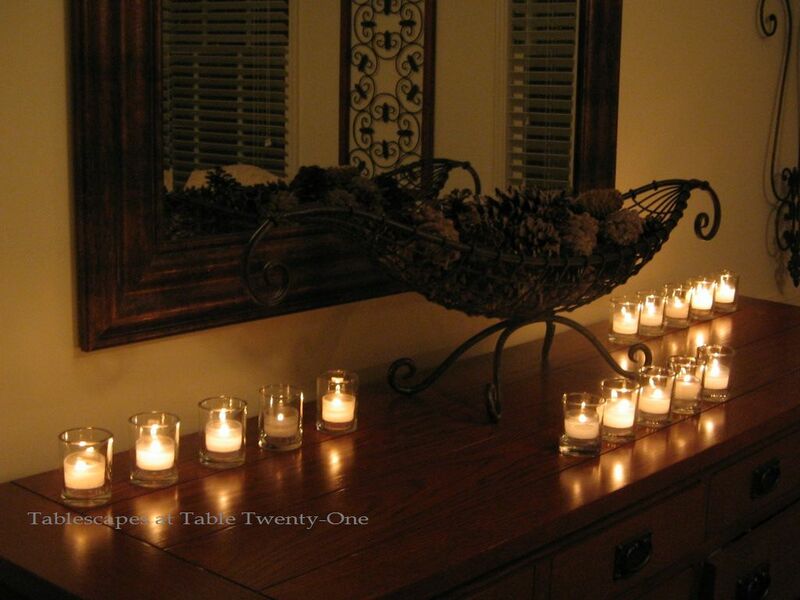 The centerpiece flowers and all those votives give it an atmosphere of romantic elegance. I love it! Hi, Fabby! I just paid a visit to your blog, and your table is beautiful! Happy Anniversary to you and your husband for so many years of wedded bliss. Te deso mas anos de felicidad y que tengas un gran fin de semana! Thank you so much my new friend Alycia for your great comments…I so appreciate them very much. The little boy came in the Meissen 3 tier compote, some like mine come with a flower lady and man…..Meissen is German porcelain, they were the first to make the very classic ONION pattern, and later some European companies made dishes, or china sets, like mine and the German Hutzsenreutcher. Bueno, preciosa, dices no saber hablar, pero muy bien lo escribes! Te deceo a ti y tu linda familia un lindo fin de semana. Los blogs que salen los Jueves son tantos y tan bellos que yo tambien demoro en visitar todos. Sigamos visitandonos…yo tambien soy quite new! Mil gracias, mi amiga! Mil gracias! Alycia, you are so beautiful, inside and out. I love every table scape you do. There is nothing wrong with your weight, embrace just how beautiful you are. Your smile is certanly more than a million dollar one. SO pretty! I have the same plates, and I’m so inspired. I can browse your page forever, Alycia.